Between the 7-10 February at Sopwell House in St Albans, Chef André Jaeger had created a Gourmet Encounter, which was a special tasting menu, influenced by his travels around the world. In this particular menu, he has been innovative, using flavours from Europe and Asia as inspiration for some remarkable dishes, which you can choose to have with a wine flight, which we did. If there are any events like this at Sopwell House in the near future, it is definitely an experience once booking a table for, as not only is the restaurant stunning, the food is creative, and a real journey through global flavours and culinary fusions. You can even stay over, which is what we did, and it is a super short train journey from St Pancras. We had opted for the Vegetarian menu, and first to arrive was some delicious bread, which we were told the chef encouraged to “break” together, in order to signify celebrating friendship. Bread was considered to be a staple that was offered when people visited your home, and this bread was absolutely delicious. We also decided to start with pink champagne and was delighted to find that it was Tattinger. I loved it and it was so refreshing. The Amuse Bouche arrived in a Bento Box, and was designed to be shared, and included Vegetable Spring Rolls with Thai Vinaigrette, Pumpkin Soup served in little shot glasses with rice Crackers and Vegetable Tempura served with the most incredible Asian infused dip. We could get flavours of sesame, ginger and soy in the dip and it was just heavenly. Our Starter was an Onsen Egg served in a Mango Jelly topped with Sesame Cream and chunks of Mango. Personally I would have preferred if this was the Amuse Bouche and the Bento Box was the starter, as it was a lighter dish compared to the Amuse Bouche, which was a generous portion. This was paired with 2016 Muscadet de Sevre et Maine, Sur Lie, France. For our intermediate course, we enjoyed a Vegetable Lasagne, made Greek Style with Courgettes and tomato, and was a stunning dish. Beautifully presented too! Comfort food heaven was the main course of Risotto with Thai Asparagus, Black Beans and Regiano Parmesan cheese. The stuff dreams are made of and perfectly cooked. As a Pre-dessert we had Chocolate sherbet with raspberries and Dom Benedictine espuma. It really reminded me of a childhood sweet but I couldn’t place what exactly it was! It was a really refreshing course and we were eager to try the dessert. The Dessert didn’t disappoint and was a gorgeous Passion fruit soufflé with passion fruit chutney, vanilla ice cream and meringue. It was just stunning! By this point we were really full and we still had one more dish to enjoy. This was paired with NV Torres, Moscatel Oro Floralis, Spain. I can never miss out a Cheese course from a tasting menu and as a blue cheese lover I adored the Saint Agure cheese in kataifi with honey, fleur de sel, beetroot and wasabi mustard. I think this would only appeal to you if you like strong blue cheeses, which I do, and so order only if you can handle blue cheese! It reminded me of a dessert we had in Athens last year, called Kanafeh. This was paired with NV Dow’s Fine Tawny, Portugal. After our dinner, we stayed overnight at Sopwell House, and we were in the Lilythorn suite, which an upstairs suite and in close proximity to an outside hot tub, which is open till midnight, and so of course we made the most of it! The room had a separate living area with a fireplace, which we were very grateful for, as well as a kitchen area. The room was cosy with a TV, cupboards, a desk and a view of the courtyard where the hot tub was located. The downstairs rooms actually had their own private tubs so something to keep in mind if you are booking a stay there. The following morning, for an extra supplement of £5.00, we ordered breakfast to our room and relaxed before hitting the hot tub again. The main building is where the restaurants, gym and spa are located. There is a brasserie, the main restaurant where we had dinner, a more casual conservatory area as well as a cocktail bar area, and so plenty of options. 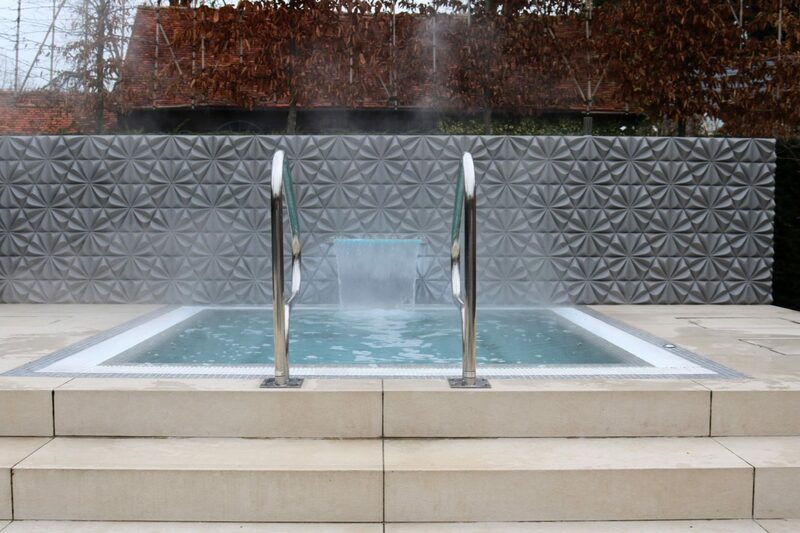 The Spa has an indoor heated pool as well as lots of treatment rooms available, and has even won an award for their day spa facilities and packages, and it seemed really popular even whilst we were there. We didn’t have time to experience it on this occasion but hopefully sometime in the future. The service throughout the hotel was excellent and a special thank you to the sommelier Peter (Piotr) as well as Gabriella for being so wonderful during our time at Sopwell House. If you want somewhere with fantastic dining options and a Spa, Sopwell is a good homely option in close proximity to London and with really good offers, so worth checking them out. Disclaimer: Our meal and stay at Sopwell House was complimentary but all views and photos are my own. Every menu should have a pre-dessert! What a great menu, I love the bento box Amuse Bouche, very different. The risotto sounds divine!